Disney’s new After Hours event allows guests to enjoy a very uncrowded park – at a price. 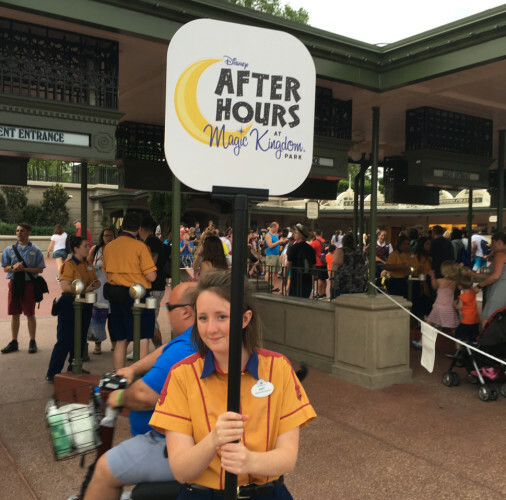 Disney’s new After Hours event at Walt Disney World’s Magic Kingdom has begun. At $150 per person, many guests are wondering if it’s worth it. We attended the first night to tell you all about it. Your event ticket is completely separate from an annual pass or day pass into the theme parks. You don’t need to have a regular ticket to go to the After Hours event. All you need is the After Hours ticket. 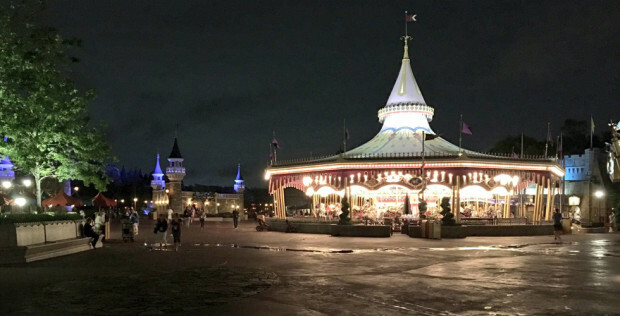 The actually event usually runs from 11 p.m. to 2 a.m., but guests may enter the park starting at 7 p.m. So you get a few hours in the park with regular guests. It’s important to note that Extra Magic Hours for Disney resort guests are not being replaced by this. They are still happening on other days. There’s a special entrance just for After Hours ticket holders at the entrance to Magic Kingdom. Once you enter the park, you’re given a lanyard, which lists which attractions will be open exclusively to you when the event offically begins. 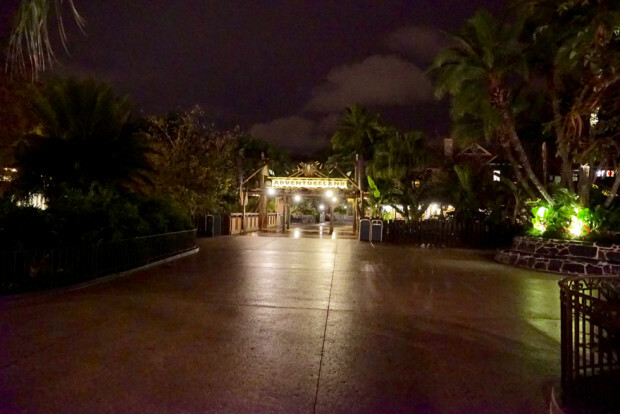 Even though you’re in the park with other guests until 11 p.m, the park tends to get less crowded as the day goes on. We attended on the first night of the event, on Thursday, April 14 and at 10 p.m., the park’s most popular ride, Seven Dwarfs Mine Train, was down to a 30 minute wait. Of course, once the park closes to day guests, it can take a while for the them to leave. But the night we were there, it didn’t take long. By 11:30 p.m., all of the rides near us were a walk-on, including Seven Dwarfs Mine Train and Peter Pan’s Flight. There are a lot of great opportunities for photos with no or few guests in them. If you’re patient, you can wait until there are no guests in the shot you want to take, anywhere in the park. This Main Street bus was driving up and down Main Street for whoever wanted a ride. That’s it. There are no special characters, no parades, no fireworks and no special souvineers for the event. 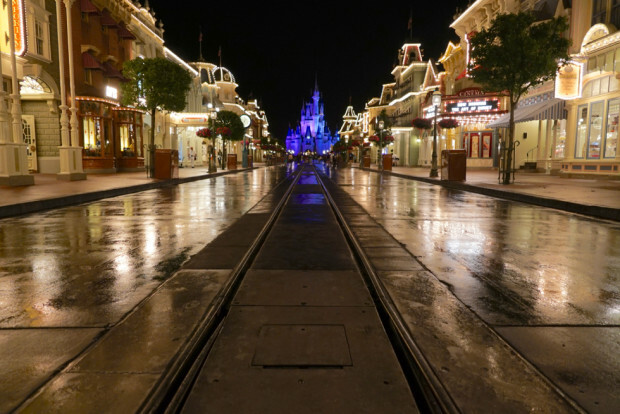 (Although guests could see Wishes fireworks and the nighttime parade with the regular day guests.) 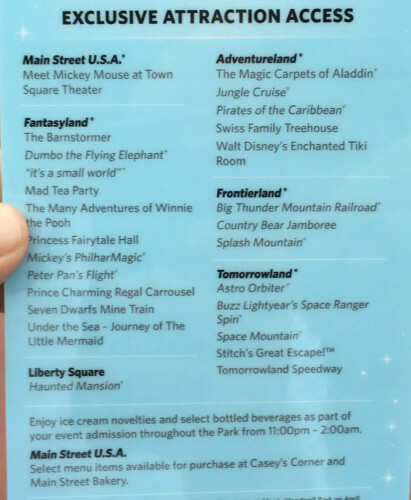 Essentially you get three hours in the park with very few guests and unlimited ice cream and soda. Although we estimated there were about 1,000 guests in the park for the event last night, we don’t know the maximum number of tickets Disney will sell to the event, so if you go, you may see more guests. But Disney is billing the event as having little to no waits for the attractions. So is it worth it? 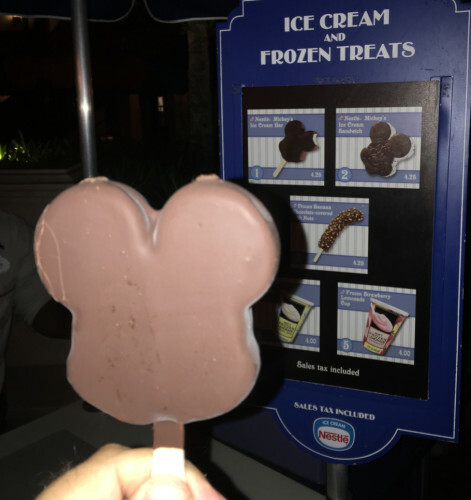 Is it better to buy a day ticket to the Magic Kingdom for $105 and have about 12 hours in the park with thousands of guests and no food or drinks included, or to spend $149 for an After Hours ticket and have four hours in the park with thousands of guests and three hours with a few hundred guests and unlimited ice cream and sodas? We hope our review helps you decide. Tickets are available through the Disney After Hours webpage, or at (407) 827-7185. Spacial thanks to The Official Ticket Center for inviting us to the event. 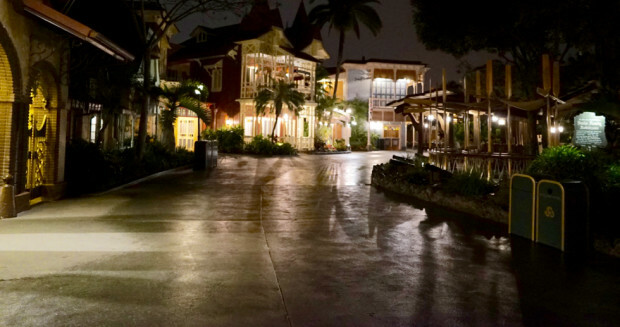 Also read our review of After Hours at Disney’s Hollywood Studios and Disney’s Animal Kingdom. We are Florida Annual Passholders and I would love to do this for my husbands birthday, but at $150 a pop.. that’s a little much. Thanks for the great review though. Another typical Disney blogger failing to disclose they did not pay for the experience. That’s a violation of the FTC regulations. If you read to the end, you’ll see we gave thanks to The Official Ticket Center for inviting us. Plus we aren’t bloggers, we’re a magazine company. Darn. I looked up patient and saw the right definition. I reworded it. Thanks. I’m not sure what you mean about deleting your informative post. We didn’t delete any posts. Just trying to understand which is the more accurate description. Thanks! Sorry. It’s corrected. By 10-10:30, Mine Train was down to a 30-minute wait. HUH? So what was the wait for Seven Dwarfs Mine Train at 11:30? 30 minutes or no wait??? Thanks for pointing that out. See my response to Steve. 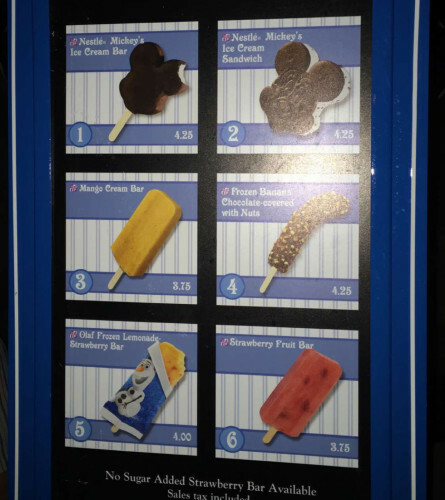 So… basically this is a nighttime admission as opposed to a daytime admission, and the only way to make it pay off is to buy at least $44 in snack treats. My sister might take advantage of this. Great review Matt. It would be a neat experience I think, but, at $150.00 per person, that’s a bit steep for my budget. I always wondered what it would be like to be able to wander around the park after hours, and, you provided a good review, but, unless I hit the Power Ball lottery, I don’t think it will happen anytime soon. Thanks for the look, and, by the way as a subscriber to your magazine, you guys do a great job! just wondering, were any of the shops open? Yes, some of them were. Most of the ones on Main Street were and the ones at the exit of attractions. I see that when the extra hours are from 12 until 2 that you are allowed in at 7. When the days are with hours from 11 until 1 will you be allowed in at 6 or do you lose an hour those day. You still get your three hours in the park with very few guests, but you do lose an extra hour in the park with day guests. Sounds wonderful, worth working overtime to save for it!! And shops open, my dream evening! Sounds like a pretty sweet deal! I could see this as a great night, er morning, with my kids when they’re teens. By then, though, I doubt I’ll be able to stay awake past 9pm (or that the price point will be only $150). I’m curious about any rain/bad weather “make up” options. Would be awful to spend that amount and have all but indoor rides closed with no choice but to “deal with it”. Thanks for sharing the info and great pics! This is somewhat the same as the Christmas and Halloween parties, where you pay for a certain number of party hours but are let in earlier with day guests (at no extra charge)thereby increasing crowds and wait times for those who actually paid for those regular hours. Sorry, irritates me when attending at those times of year. At least this doesn’t seem to cause the parks to completely close to day guests as early (7 p.m.) as the parties do. I agree with others, too expensive and especially without special parades, fireworks, shows, characters, etc. that the parties have, even if there are fewer guests. You also stated that you could either pay $105 for a normal day ticket or pay $149 for this event. We also need to consider that if you’re on a multi-day ticket, your cost for a full day would be substantially less, so you would need to compare apples to apples. If the price is reduced substantially, and the number of tickets doesn’t increase substantially, maybe. Soooooo. You got the tickets for free to preview After Hours. Of course it was “worth” going… ? I never said it’s worth going to. That’s up for you to decide based on the price you’d have to pay. I hope my review helps you decide.